You heard us rave about Warmind two weeks ago, and here we are a month later, and we just can’t get enough! Once again, the Guardians gather on mic to talk about their experiences in the Crucible, and talk a bit about how the lore is everywhere…including the Real World. Enjoy Part Two of our review of the Warmind DLC. 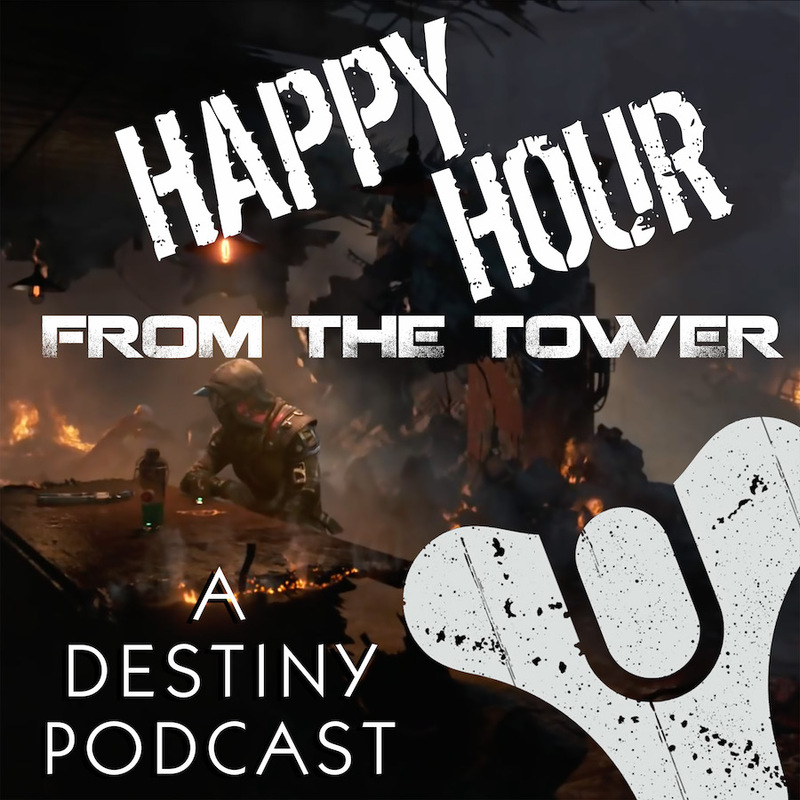 Want to send some feedback to the Tower on this new DLC? Talk to us at 703.791.1701 or podcast (at) happyhourfromthetower (dot) com. Our little B10hazardBabe is all grown up now. So hold on, if we’re timeshifting, does that mean…? Swing by the YouTube Feed for a look at some of these drop-in inspiring moments. Let’s talk about weapons and armor. Nick and Coach try to cheat the game, but the Bungie boys are on it. Nick will not surrender his A/O Feedbacks. Coach has come back to the Sunshot. It’s a favorite. How about a share of trash talk? Tee’s feeling the love for sniper rifles (and some of the original D2 exotics) again, in particular the Borealis. Ana’s weapons are kickass. Nuff said. The guys…sans Tee…have achieved the Word-Line Zero. Tee’s got to get back into the grind…or the hunt. Ron’s Quest for Music Boxes…or Sleeper Nodes! How are we feeling about the PVP changes? The biggest change for us on the show? Jenny. The Nightfall served as a fun romp for Tee, Marv, and Munch. Ooops — need to break! What is Brandon doing with Tee’s printer? First bit of lore to know about — who is Willa Bray? Wouldn’t a bound volume of Grimlore be nice? Or just make it easily accessible. A little tangent on Zavala as Warmind is his story. Something about Xur’s treehouse on Nessus in that first week of Warmind. How many of these little Easter Eggs did you find in your first week with the DLC? Some lore on Ana’s sister Elsa…and who she has become. And if that wasn’t enough to blow your mind, the game crosses into reality. What about the ship that is buried in the Lost Sector of Mars? Did you scan it? Tee is excited about what is being hinted at, but he wants to go explore more of the Warmind. There has to be more to Rasputin. That’s a BIG facility. Yes. Tee FINALLY got the Selfie emote! Me & TheBigMarvinski at the Warmind! Come on, Munch! Selfie Time! Got a Selfie you want us to feature? And review the podcast! We love reviews! Coach praises Warmind, but there is still a caveat. Nick is very happy with the windfall of lore! Tee is enjoying the dive into the DLC! Brandon was fired up to do the exit…but then…..
Next Post Episode #39: GuardianCon HYPE with KMagic 101!! !